Pack of 100 Certificates - Anaconda Company (Anaconda Copper Mining Company) - Price includes shipping costs to U.S.
Home > Certificate Quantities for Educators / Business Promotions > Pack of 100 Certificates - Anaconda Company (Anaconda Copper Mining Company) - Price includes shipping costs to U.S. Beautifully engraved certificate from the Anaconda Company. This historic document was printed by American Bank Note Company and has an ornate border around it with a vignette of two allegorical men on the sides of a large mine and mill area and their is an underprint of an arrowhead on the bottom. This item has the printed signatures of the Company�s President and Secretary. Anaconda Copper Mining Company (also known 1899-1915 as the Amalgamated Copper Mining Company) was one of the largest trusts of the early 20th century. Founded in 1881 when Marcus Daly bought a silver mine, the company expanded rapidly based on the discovery of huge copper deposits. Daly built a smelter to process copper mined in Butte, Montana. 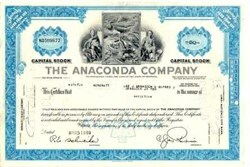 By 1910, Anaconda had expanded its operations and bought the assets of two other Montana copper companies. In 1922 it bought mining operations in Mexico and Chile; the latter was the largest mine in the world and yielded two-thirds of the company's profits. The company added aluminum reduction to its portfolio in 1955. In 1960 its operations still had 37,000 employees in North America and Chile. It was purchased by Atlantic Richfield Company (ARCO) on January 12, 1977. Anaconda halted production in 1983. It currently exists only as a massive environmental liability for BP, the current owner of ARCO.